This is a list of all spindles tested and approved by Inventables. It also has links to the mounts. The forum does not allow me to make a table so here is a link to a read only spreadsheet. hey bart the 24v spindle is listed at 14000 rpm. is that the only rpm its capable of? i had an assumption it had a range of much lower and higher rpm. easel has a default rpm of 18000 so i never change it there. I updated the spreadsheet to (max) for the speeds on the DC spindles. 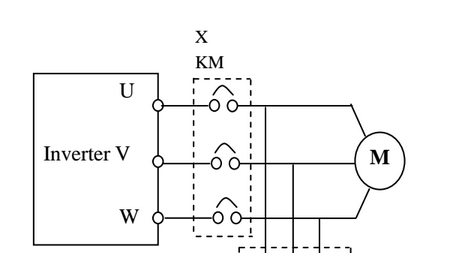 The DC spindles can be speed controlled via PWM with our default setup. The spindle can be commanded to go slower, but they will also have less power. Our Grbl setup has a hard coded max speed of 12000 rpm. That means 100% spindle speed when commanded to go 12000. If your spindle goes faster it will. When commanded to go 6000 rpm it will have a 50% duty cycle. It will go slower, but not exactly 6000 rpm. Any value above 12000 is the same as 12000. None of the DC spindles have an exact rpm. It is like asking how fast your car will go with 100% or 50% throttle. Factors like load affect the actual speed. I was over at MicroCenter in Chicago last week and they had a nice selection of watercooling components and systems. I suspect a system like http://www.microcenter.com/product/438040/H220-X_CPU_Liquid_Cooling_Kit could be adapted for the .8kW spindle. @BartDring what size wiring did u guys use between the VFD and the 0.8kw spindle? We bought a good quality 16ga round extension cord at Home Depot (25ft @ ~$10) This had 3 wires with good strand count. We soldered one end to the connector and attached the other to the terminal block on the VFD. Don't worry about which wires go to which of the U,V,W terminals. The worst case is the spindle will spin backwards. If the is the case then just swap any 2 of the 3 wires. BTW: We just got the air cooled version in the shop. It is super quiet. I think I prefer the air cooled over the water right now. The noise is similar and it is a lot easier deal with (no water lines). We plan to do a complete write up on how to use one of these with an X-Carve. The VFD has several options and settings. We will present a quick setup and discuss some other options. BTW: We just ordered the pilot production run of the X-Controller. It now has an option for the 0-10V speed control these VFDs need. We have been using it for all testing of these spindles. The pilot production run is just to shake down the process of building the controller boards. We will then order production quantities. I will be patiently awaiting the right up on using these larger VFD spindles! I think I will be upgrading mine to this at some point! I was planning on upgrading to a VFD spindle as well. It seems that these are the best option if you want to be able to maintain torque at low RDP. Do any of the VFD spindles support ER16 collets instead of ER11? I would really like to be able to use bigger endmills like 3/8" and 10mm. That combined with the good torque at low RPM would allow the use of flycutters to give a good mirror finish on aluminum. I would discourage using spindles larger than 65mm diameter on the X-Carve. I don't know of larger collects on this size. Please be aware that these spindles are complicated and require quite a bit more wiring. We can only offer forum support at this time for them. I don't want anyone to buy one of these without knowing what they are getting into. hard coded max speed of 12000 rpm. That means 100% spindle speed when commanded to go 12000. If your spindle goes faster it will. When commanded to go 6000 rpm it will have a 50% duty cycle. It will go slower, but not exactly 6000 rpm. Any value above 12000 is the same as 12000. Another question, is that the standard 611 mount in the picture above? Or did it require modification? @BartDring Since you've used both now, Have you noticed anymore heat with the air cooled over the water cooled? The air cooled one does get warm (not worrisome) to the touch where the water cooled one is not even noticeable. I am at our bi-weekly Beer and Making event right now and we just ran a bunch of jobs on it. Thanks! Is your air cooled one 120V? I am having a hard time finding an air cooled that is not 220V, seems just the water cooled ones come in 120V. @DavidLovely We only bought one VFD. It came with the water cooled one. You can sometimes buy them separately. I would contact the sellers. They might be able to create the right pair for you. @BartDring I hope I am not bothering you too much! With the 0.8kW water cooled spindle, were you able to get the water lines and power cable (16/4) in the stock drag chain? @DavidLovely. We did not put it in the drag chain. It did not look like it would fit. We probably swap spindles on that machine 6 times per week. It is our main test machine, so we take a few short cuts. 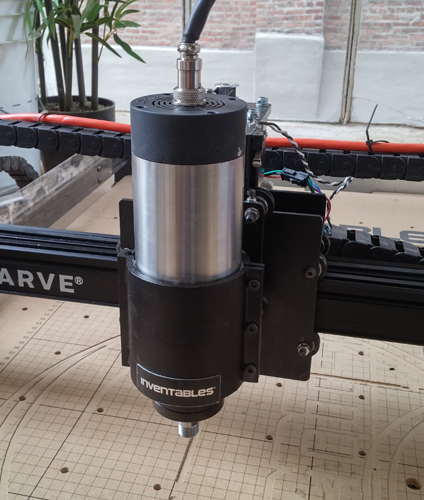 Can you upgrade to the 400W or 600W spindle when getting an X-Carve, or do you have to purchase them separately? Any time frame on offering the 110VDC power supply upgrade?